The battle between the Autobirds and Deceptihogs wages on in IDW's upcoming miniseries. In one of the crazier licensing deals to come out this year, it was announced last month that Hasbro was teaming with Rovio Entertainment to develop a new mash up of the hit Angry Birds franchise. This time, there would be more to the battle between birds and pigs than meets the eye, with the release of Angry Birds Transformers. Now, IDW Publishing is getting into the mix, as the publisher of the Transformers comics announced today that it will be releasing a new, four-issue miniseries tying into the upcoming game. 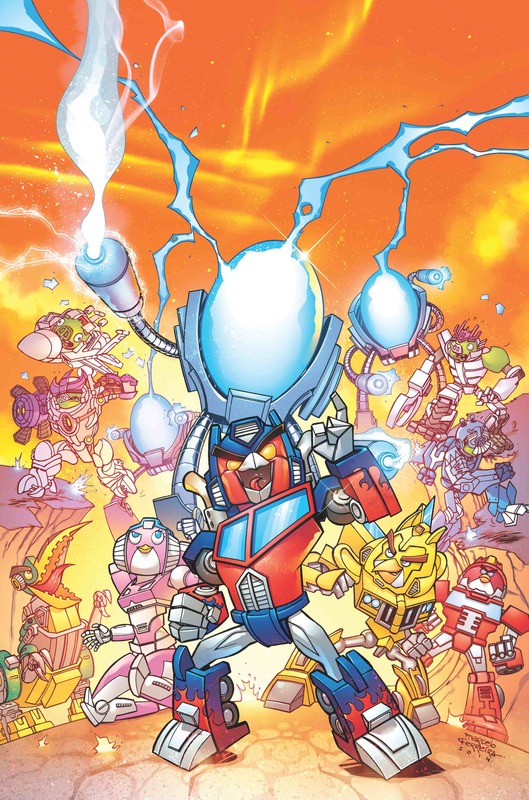 Written by IDW Senior Editor John Barber (Transformers: Robots in Disguise), Angry Birds Transformers has set the stage to take both licenses into a strange new universe of adventure. The series opens with a Deceptihog raid on the Autobird ship. During the battle, the Allspark is hurled into the expanses of space, only to find its way to the shores of Piggie Island. There, its inhabitants learn that the Allspark is much more powerful than any creature could have imagined. IDW will bring together an "all-star flock" of Transformers artists will be contributing covers for the four-issue series, including Sarah Stone, Guido Guidi, Casey W. Coller, and Livio Ramondelli. Ramondelli will also provide artwork for a framing sequence of issue #1, focusing on the Transformers universe, before handing off the art chores to Marcelo Ferriera (Kung Fu Panda, TMNT New Animated Adventures) for the rest of the series. "Comics offer an ideal medium for telling the stories of these improbable but totally convincing mash-up characters from two enormously popular creations," said Rovio's Editor-in-Chief, Comics Jukka Heiskanen. "Blending action with humor and adventure with mishap, they will excite and delight fans of both brands." The Angry Birds Transformers game and toys are due out in September, and the comic series is currently slated for a Fall 2014 release. In the meantime, check out the latest Angry Birds Transformers trailer, released by Rovio yesterday at Comic-Con.